The American jazz tradition has produced an array of legendary pianists/composers whose larger-than-life names are perfectly suited for their superior talents: Thelonious Monk, Horace Silver, Bud Powell, Cecil Taylor, McCoy Tyner, Horace Tapscott, to name but a few. Add to that list, Lafayette Gilchrist, who makes his national recording debut with the release of The Music According To Lafayette Gilchrist. 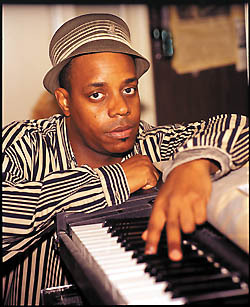 Hailing from Baltimore, MD, Gilchrist first arrived on the national music scene in 2001 as the pianist in tenor saxophonist David Murray’s group; a position he still holds to this day. Leading a seductively subversive sextet, Gilchrist brings a flavor to jazz that is completely of his own vision. Bursting horn lines, D.C. go-go influenced rhythms, dark, twisting piano figures and rapturous melodies signal the arrival of an artist whose name will one day sit perfectly alongside the legends of the jazz pantheon.